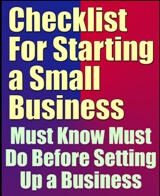 This guide will walk you step by step through all the essential phases of starting a successful business. Owning a business is the dream of many people ... starting that business converts your dream into reality. But there is a gap between your dream and reality that can only be filled with careful planning. As a business owner, you will need a plan to avoid pitfalls, to achieve your goals and to build a profitable business. The checklist is a guide to help you determine if your business idea is feasible, to identify questions and problems you will face in converting your idea into reality and to prepare for starting your business. 5. Is Your Idea Feasible? 1. Freedom from the 9-5 daily work routine. 3. Doing what you want when you want to do it. 4. Improving your standard of living. 5. Boredom with your present job. 6. Having a product or service for which you feel there is a demand. Some reasons are better than others, none are wrong; however, be aware that there are tradeoffs. For example, you can escape the 9­ to 5 daily routine, but you may replace it with a 6 a.m. to 8 p.m. routine.